“Change does not roll in on the wheels of inevitability, but comes through continuous struggle.” Martin Luther King, Jr.
Hey, at least it’s “mobile.” At Mobile World Congress in Barcelona, in amongst all the shiny new cellphones and tablets, was a new product that weighed in at 2,150 pounds (975 kg), consumes up to 1200 kW, and can go almost 200 MPH. No, it’s not the new Surface tablet falling off a cliff. But it is a new platform, of sorts. 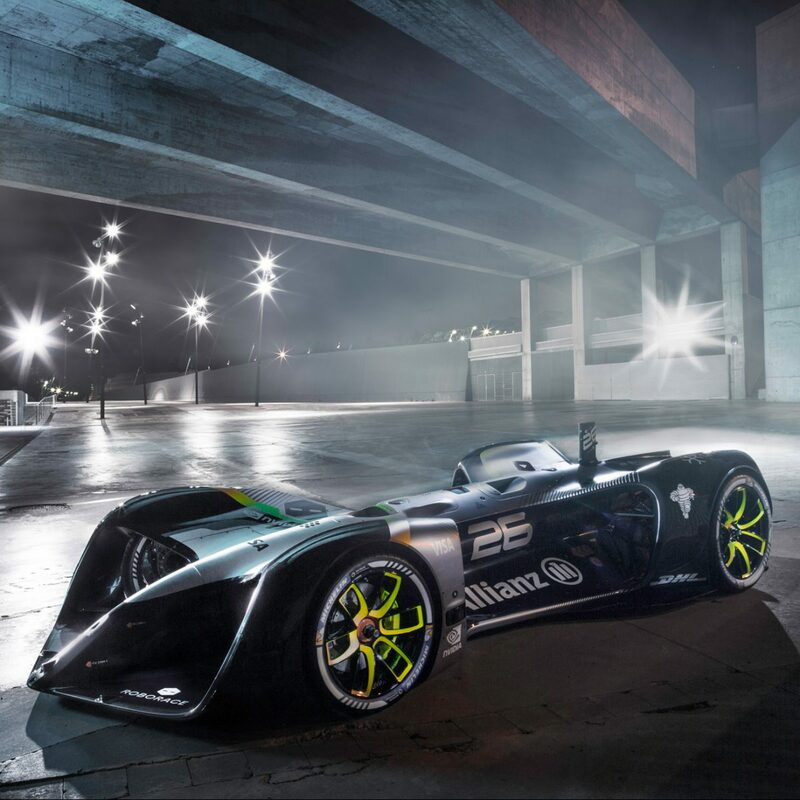 It’s the Robocar, the first of a new series of autonomous, robotic race cars designed and built exclusively for a new global racing series for driverless vehicles. Robocar is electric, of course, and it has four wheels. But that’s pretty much where the similarities with “normal” cars – even normal race cars – end. Its appearance is somewhat exotic, which isn’t surprising since its styling was done by a movie special-effects expert. It certainly looks aerodynamic, and why not? There’s no driver to worry about. No passenger-safety issues. Just propulsion, tire traction, and downforce. All the rest is window dressing. Which raises all sorts of interesting questions, starting with: What’s the point? Roborace’s goals are threefold, according to series founder and CEO Denis Sverdlov. First, it’s to help promote electric vehicles. Second, to accelerate the development of autonomous, driverless technologies. And third, to be an interesting sport for both spectators and participants. Fair enough. Back in the early 1900s, when gasoline-powered (as well as steam- and alcohol-powered) cars were new, strange, unreliable, and more than a little scary, competitive road races were a popular way to prove that the cars were safe, reliable, and reasonably affordable. “Race on Sunday, sell on Monday,” went the old automakers’ adage. Some of those old road races are still with us. Does the French village of Le Mans ring any bells? How about Indianapolis? So Sverdlov’s idea is to set the robotic race cars loose on tracks throughout the world as a way to attract attention, generate interest, and – not incidentally – stimulate development of autonomous vehicle software. The hardware will be standardized across all the race teams. You have to buy the base car, but you can develop your own software for it. Indeed, that’s partly the point. Since the cars themselves are identical, it’ll be the software that determines the winners and losers. Just like in the regular mobile business. Will spectators watch robotic race cars? Maybe. Personally, I think it would be great – a sort of cross between a competitive spectator sport and a live debugging session. The cars aren’t radio-controlled; there’s no human input once the green flag drops. They’re entirely on their own, so any jockeying for position, collision avoidance – even just finding their way around the track – all has to be done by onboard logic in real time. Once the race starts, the engineers will presumably just stand around with their hands in their pockets. Or bite their nails. The standardized Robocar hardware lowers the barriers to entry, since building an entirely new car from scratch would be daunting. Batteries, motors, chassis design, suspension geometry, and lots more would be involved just to get rolling. An off-the-shelf Robocar means competitors/engineers can concentrate on their software, while leaving the basics to someone else. Again, just like in normal product development. Why reinvent the, uh, wheel? Exotic as it is, I don’t think any pure racers would look like Robocar. For starters, why have four wheels? Why have wheels at all? Am I allowed to use magnetic levitation, spikes on the outside, or big flamethrowers? Bending the rules is all part of engineering. Once the regulations are relaxed, the creative ideas come out. Back in the 1960s, real-life Formula One race cars had six wheels, simply because the extra wheels gave more traction and the rulebook didn’t say you couldn’t. Race cars sprouted wings because it wasn’t against the rules and nobody had thought of it before. Some cars had a second engine driving a vacuum pump that sucked the car to the ground. Venturis, computer-controlled suspensions, adjustable aerodynamics, hidden fuel tanks, 7/8-scale cars, and plenty of other bizarre ideas pop up when creative designers find loopholes in the rulebook. Why does a robotic race car even have to look like a car? Roboraces could become very innovative – and very strange – events if the competitors are left to their own devices, as it were. If the goal is simply to move an object around a track more quickly than everyone else, under its own power and its own guidance, than we’re going to see some very un-carlike competitors. Will that make the events more interesting, or less? It might increase the engineering challenge, but decrease spectator interest. At some point, these odd-looking contraptions will be whizzing around the track too fast for the eye to follow, which makes for poor spectating. And it’ll be hard to convince the average viewer that the funny-looking wedge-shaped droid rounding Turn Five is somehow relevant to his family sedan. That’s why even “open” categories have rules. The occasionally syndicated Robot Wars, which appears to welcome all sorts of eccentric robot designs, has its regulations. No nets, for example. You can’t capture your opponent in a net because, although they make good defensive weapons (just ask any gladiator), they’re bad TV. More flamethrowers, please. The Drone Racing League (yes, that’s a thing) also has standard hardware, like Roborace. Here, the competitive aspect comes from the drone pilots, not automation. But it also has its challenges. Between the dark and claustrophobic interiors of abandoned warehouses and the nausea-inducing FPV camera view, drone racing is tough to watch. But interesting nonetheless. What doesn’t seem to have trouble gaining spectators are e-sports like League of Legends. Here, the game is entirely imaginary; it’s all software with no physical component at all. Game tournaments pack in fans by the tens of thousands. Las Vegas is building an e-sports arena devoted to watching other people play computer games. The winning strategy seems to be less hardware, more software. Just like in normal product development.